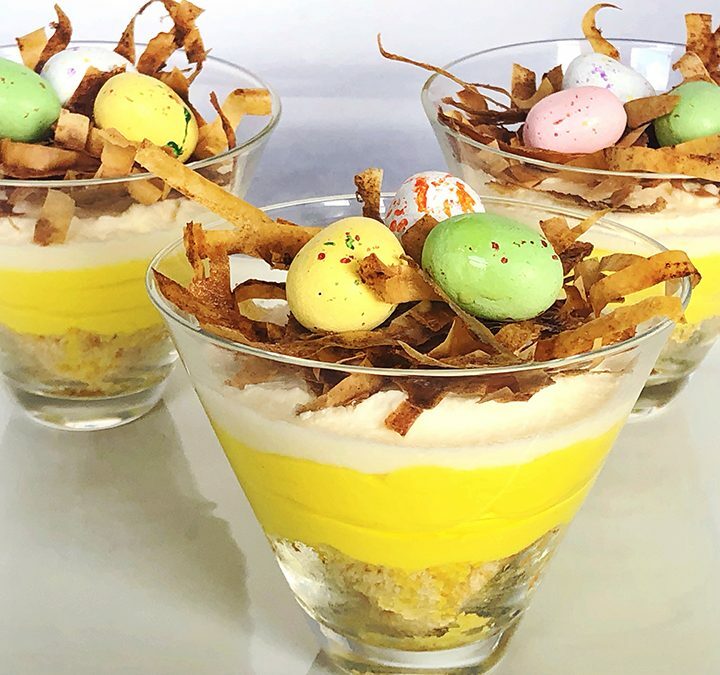 Greet spring in a cheerful manner at any holiday celebration with these cute birds’ nest lemon cheesecake trifles. Using a no-bake recipe, the lemon cheesecake is a yummy whipped mixture of lemon curd and mascarpone. The “nest” is made with thinly slice phyllo dough, topped with cinnamon/sugar and the base is shortbread crumbles. If you need to cut some time, you can always use high-quality store-purchased shortbread cookies. Preheat the oven to 350˚ F. Place a sheet of parchment paper on a baking sheet tray. Cut 6 sheets of phyllo dough in half to make 12 shorter sheets. Roll together tightly and very thinly slice into long thin pieces then transfer to a baking sheet carefully separating the layers. Combine the cinnamon and sugar in a small bowl. Sprinkle with butter, then with cinnamon sugar. Bake until browned, 8 to 10 minutes. Remove and cool completely. Preheat the oven to 350˚F. Butter an 8×8” pan. In a large bowl, using an electric mixer, cream the butter and sugar together on medium-high speed for 3-4 minutes. Fold in flour and vanilla and blend until a soft dough forms. Press into the 8” x 8” pan and bake until light brown, about 40 minutes; remove and cool completely. Crumble then divide equally among the cups and press the mixture evenly into the bottom of the cups. Using an electric mixer on medium-high speed, beat mascarpone, powdered sugar, and lemon zest in a large bowl until fluffy, about 4 minutes. Reduce speed to low and gradually add the cream. When combined, increase the speed to medium and beat until medium peaks form. Transfer half of mascarpone mixture to another bowl. Add the lemon curd to the remaining half and beat in until combined. Dividing the mixtures evenly, layer the lemon curd mixture over the shortbread crumbs in each cup followed by the plain mascarpone /cream mixture. Smooth the top, cover, and refrigerate for at least two hours and up until 24. When ready to serve, form a nest in the top of each cup using the shorter pieces of cinnamon phyllo in the center and longer on the outside. Add the candy eggs into the center of the nest and serve immediately.